What type equipment do you have? 2x4 construction is strong enough. You are adding a lot of strength with the beadboard skin. Also will help prevent racking. I wouldn't use pt 4x4 posts. I wouldn't use PT on any stand I build. If you do use a 4x4 out of cedar or other wood you have to notch/dado the horizontal members into it. With simple 2x4 you make a pseudo dado when you add the extra support pieces. You CAN find decent lumber out there. It's a matter of taking the time to sight the wood. And it doesn't matter. 2x6 has the same problems as 2x4. It's an organic product. It shrinks and swells. Acclimate your wood before milling it. Make sure you crown the 2x4's for the top. Between that and the plywood you put on top of that it should be flat enough for the acrylic tank. If its anything like around here I have to go through several boards for one good one. Some of them look like they were pre-bent for a rocking chair. I might have to go through 40 boards to find 4 or 5 that will work. For the top of the stand I would buy a sheet of good quality plywood. At least 5 layers and 7 would be better. Then cut it to size for the top. That way you have a good flat stable surface for the tank to sit on. After that 2X4s will work if you support it correctly. Don't depend on any mechanical joints to hold the weight. So build it where there are no nails or screws holding the weight. Thanks guys, I think that I am probably worrying too much. I have always built my stands like this. I read a bit more his morning and talked myself back into all 2 by 4 construction. I don't have a table saw at the moment, so I will have the plywood cut at home Depot, but the guy at my local is usually pretty good. I have a chop saw for the 2 by 4s. I'll just have to make sure I go pick out lumber without the wife so that I can take my time. Well, if you are in the DFW area you can drop by and use my table saw. Here is a photo of the stand I built for my 150. Nice work. I have a table saw, but it is in my dad's garage two states away. I haven't been in a hurry to bring it over to my house because I know a guy at the local HD that does pretty good for me in the store. Lucky you... the guys at my HD can't care less. You can do it all with nothing more than a circular saw. Even with a pretty full wood shop I still wind up building my stands with a circ and sometimes a router. If I am really feeling it I forgo the router and just do it with a hand chisel. A very sharp chisel. Just as an FYI, the compressive strength of a 2x4 is pretty impressive. The link below is an on-line calculator for wood columns. The cheapest wood listed is the Spruce-Pine-Fir (South). I used Grade #2 and set the unbraced height at 3' for both the X-axis and Y-axis. This yields a compressive strength of 2,603# for a single 2x4 and 6,274# for (2) 2x4 connected together. Much of the "talent" of building good stands is starting with good wood choices and that can be simple. One big mistake is thinking treated lumber is good but remember that it is almost always a species which grows fast like pine and is then soaked in the treatment while still very green. That gives you a really green, wet wood which is almost certain to warp or twist as it dries if you do not take extreme care. The far better wood is the really nice light feeling wood as it is far more likely to be dry. The common, cheap 2X4 stud is by far a better choice as it is both readily available at a good price and dry. You want straight with no knots, do give it a good look before choosing. And that is where some "talent" may help to choose the straight stuff. If one is used to doing this, we can use the old carpenter trick to sight down an edge but a different method is better for the new folks. Find a board which kind of looks straight, lay it on the floor and lay a second next to the first. If they fit tight against each other, turn one over and see that it still fits tight for the total length. If they do, both are likely to be straight but if not, find another and decide which is the truly straight one and then you have "standard" to use for choosing the rest that you need. No "talent" needed as all you have to do is look for gaps. The U-tube above is a perfect example of why I do not like it for training how to build stands. Making videos is not the same as knowing how to build stands! This is NOT the way to build a stand!! Only use 2X6 if you are just wanting something heavy as it does nothing for the overall build. Great advice Rich. I am not the biggest fan of the self-proclaimed King of DIY, but the design is good and not his. It was just the first example that I found. I did try to grab the link at the right time so that you could see the board layout without actually having to watch the vid. My complaint is not so much that it is not strong enough but the general waste of time and material which shows he understands very little about the wood he is using. Double 2X6 at the corners and then double bracing on the horizontals is really missing some of the idea of why we want to do things. A single upright at a corner does have some obvious chance of warping as it dries but doubled in the way he has is not the best way to avoid that. Far better use of the wood and less waste in both money and weight is using 2X4 verticals joined at a 90 degree angle. If we put two boards together with the wide sides against each other and don't look at how the grain runs, we can find both boards may warp in the same direction but if we use two boards and put them together at an angle, they are almost impossible to bend, just as a single small angle iron is much stronger that a single flat stock of double the thickness. GraphicGr8s and Immortal1 like this. I get that, and it is a good point Rich. He should probably talk about that, if he even understands it. I won't spend time defending the guy, he was an easy example, not someone that I am a particular fan of. I like to triple up the boards in the corner for essentially that reason. Each corner has 1 longer board and two shorter boards, and I think that it would be fine with just the 2 shorter ones between the frame perpendicular to each other. I think that the assembly is much easier with the third inside. Since it is only really holding the top and bottom frame together by screws, I don't like to rely on it at all for load bearing. To your point, the design could be modified by rotating the longer board in these uprights 90 degrees. I also intend to slap some glue in between all of these joints. Does that make sense, or am I peeing into the wind here? Many of the things we do will have to take into consideration what we are set up to do correctly. The design with using more wood at the corners can be the correct method if we are short on tools but if we can cut a 45 degree miter, which is an easy thing with a cutoff, miter, radial arm, or table saw, but might be questionable if we are trying to cut a miter with a handheld saw like a circular/"skill" saw as the miter might not be true. But the same is true if we don't cut the ends totally square when cutting 90's! So using the right tools can be very important to how strong the result. If we can cut a decent miter, laying the top boards flat, cutting 45 at the corners and screwing and gluing the mitered ends can let us then lay the top on two 2X4 glued and screwed together to form an angle for the uprights. One of the things I like about this is the speed of building two sections (top/bottom) just the same and then adding them to the uprights. The only remaining boards to add are whatever we feel is needed to frame for any doors and as a way to assure the top and bottom wood can't twist or bow in any way. I add 2X at each edge of the doors as it makes the door attachment solid. At the joint between top/bottom and uprights, some thought about the exact placement will get a better joint. Look at the way one portion of the upright can run under both boards of the top and you can see that one single boards should support both boards of the top and that keeps either part of the mitered top from drifting up or down to weaken that joint. Basic construction thinking tells us that it is always better to stagger the gaps at joints so that each section is supported by the next. That is why brick is often staggered to get better strength. 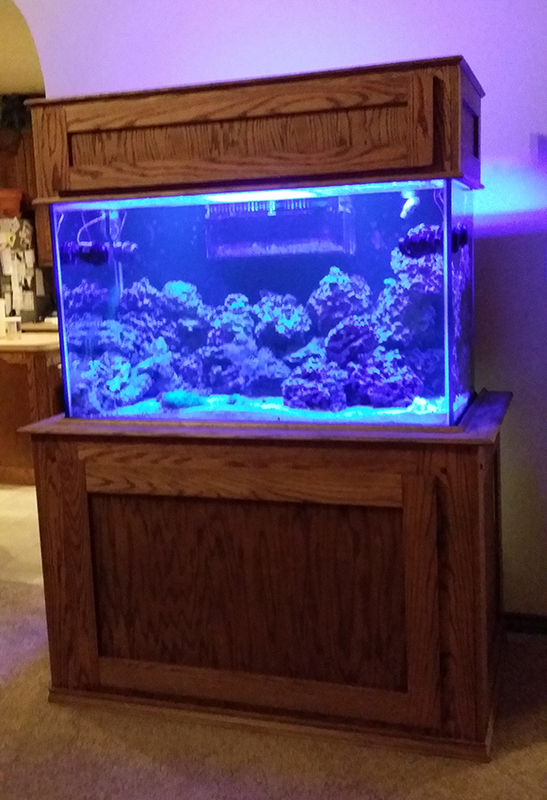 If one has the standard tank that uses the frame of the tank to set on and the glass is actually not down on the top, there is little value in adding a solid surface as it supports no weight at all. Most tanks only set suspended on the rim! Using good grade plywood to keep the top from warping is just a feel-good project. When making joints that I do want to stay put, I do highly favor a good wood glue that soaks into the fibers and makes the joint stronger than the wood in many places. I also use long screws, both to speed assembly and to add some strength. Cut four #1, four #2, Glue and screw them together with long screws at an angle to catch both boards. This makes top and bottom. If the corners are square, you've done it right! Cut 4 #3 and 4 #4 or 8 of the same ? Glue and screw them together to form four corner uprights. At the same time you are cutting the uprights and have the jig set, cut any added supports for uprights at the door or more to firm up the top if it is a long tank. Cutting them all the same is a key point! Set the top on the corners support so that one board of the corner overlaps the miter, glue and screw it on at all four corners and add the extra uprights. Skin it and add trim, etc. to suit whatever taste you want. This design will hold any size tank at any height you want. It is so basic and simple that the only change needed is cutting the boards to different lengths and possibly adding more uprights for tanks which are much longer. It has the additional advantage of having lots of wood at the floor, so that it is less likely to mash into any of the soft floorings we might put it on. It will still mash carpeting under a big tank but less that if we put the thinner side down. KISS it and be done!